On Thursday the S&P slipped for the fourth time out of the last five trading sessions. But this shouldn’t surprise anyone. 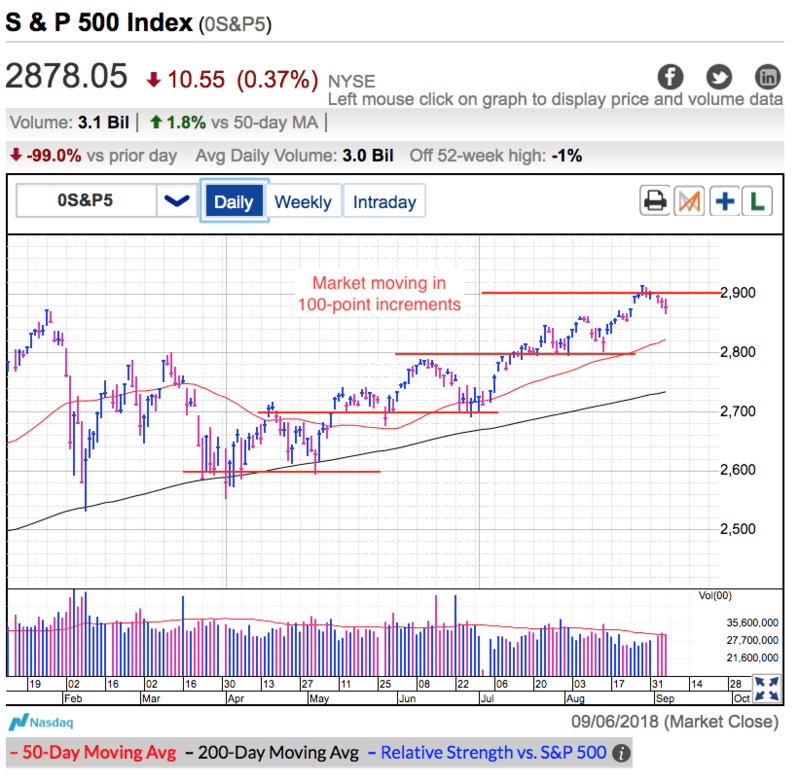 It was a strong run following August’s decisive rebound off 2,800 support. Markets cannot go up like that indefinitely and a cooldown was inevitable. If the best trade is buying weakness and selling strength, no matter how safe 2,900 feels, this is definitely the wrong time to be buying. Resist the temptation to chase these prices higher because recent gains make this a far riskier place to be adding new money. The risk/reward shifted away from us because a big chunk of the upside has already been realized while the risks of a normal and healthy dip increase with every point higher. In fact, if the best trade is buying weakness and selling strength, this is actually a darn good time to start thinking about locking-in profits. Remember, we only make money when we sell our winners and it is impossible to buy the next dip if we don’t have cash. I don’t have a crystal ball and I cannot predict the future, but when the market keeps doing the same thing over and over again, it isn’t hard to figure out what comes next. As I wrote last week, it was inevitable the Canada trade deal wouldn’t be fast or easy. Missing Friday’s arbitrary deadline is all it took for last week’s hope to turn into this week’s disappointment. But to be honest, Canada’s refusal to be Trump’s lap-dog shouldn’t surprise anyone. The fact most people saw this coming means this latest round of weakness will only be a modest dip, not the start of a bigger crash. We fear what we don’t know, not what everyone is talking about. If we were going to crash because of trade war headlines, it would have happened many months ago. The fact we keep holding up so well tells us this is a strong market, not a weak one. Thursday’s dip found support at the old highs near 2,870, but that doesn’t mean this dip is over. While I like buying 2,870 a heck of a lot more than 2,920, I still don’t feel the need to rush in at these levels. Sometimes markets consolidate gains by pulling back. Other times they do it by trading sideways. It is still a little premature know which way this consolidation will go. Maybe we dip a little further, maybe we bounce back to 2,900 but struggle to climb back above. Either creates an effective consolidation, unfortunately right now the only thing we can do is wait for more clues. The good news is we should know more over the next couple of days. At this point it is still a little too early to buy the dip. The discounts are modest and the profit potential is limited. I prefer better risk/rewards and am willing to wait a little longer. In a perfect world, we crash all the way down to 2,800 support before bouncing. That would give us a second opportunity to profit from the move up to 2,900. If only we can be that lucky.